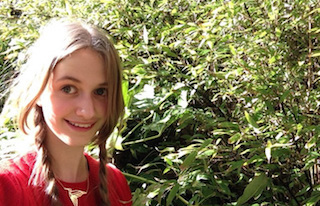 Leicester Grammar School Year 10 pupil, Hope Sharp (15), will be attending this year’s Chelsea Flower Show. However, unlike last year when she visited with her parents, this year she will be an expert working on the Bowden Hostas stand. Bowden Hostas specialise in shade-loving hostas, ferns, tree ferns and bamboo. When Hope visited the stand in 2014, she impressed owner Tim Penrose with her knowledge and demeanour. Over the last year, Mr Penrose has kept in touch with Hope and set her ‘homework’ to further extend her knowledge. She has continued to impress him and this year he has invited her to be one of his team on the stand at the prestigious Chelsea Flower Show. Tim Penrose is looking forward to the Show and commented “We love driving the age of our team down. Having Hope as part of the Bowdens team just goes to show that there are young people with drive and ambition. Hope reminds me of myself at the same age. I am sure she will very soon be after my job as chief executive. We are looking forward to a brilliant Chelsea and going for Gold!" Hope has permission from Leicester Grammar School to attend the show for work experience. She will be acting as one of their advisors on the specialist bamboo plants they will be selling from 20th to 23rd May at the Royal Chelsea Hospital in London.